It seems as long as I have worked the tasting room there is always questions about that mysterious Port bottle. You know, the long skinny one that always draws attention to its self just by virtue of looking different. It gives that indication that it by without at least an there might be something you’re missing if you pass inquiry. Actually Port wine has as interesting a history as its bottle might insinuate. Vinho do Porto, what we commonly refer to as Port, is actually the product originated in Douro Valley in Portugal. Named after the city of Porto, Port gained its primary international fame in the early 17th century. When the French and British were engaged in many disputes over the late 1600s the irritated British decided to take their opposition of France to a new level. Historical Drama Continues...how to make port wine! The prime minister at the time, cut off the importing of those desirable French wines from the English. Desperate for something comparable, the British and Portuguese merchants took advantage of the 1703 Treaty of Methuen which produced a new and unique trade covenant reducing the amount of taxes imposed on Portugal’s wine exports. This of course was a win /win for both countries (and historically the rest of us as well). So as you can imagine this wine, with its colorful history should not be so easily passed over. Port wine is a regional wine, meaning it gets its name from the region it is from not from the grapes from which it is made. Usually Port is made from a variety of grapes but always fortified with aguardente (for the commoners amongst us, we will call this… brandy). The fermentation process is interrupted, the brandy is then introduced to process and then back to the aging. The final gift is the beverage of greatest delight for those of us who enjoy that warm feeling that starts deep down in your chest and rises to the back of your palate. This is the feeling that says “life is good” even when winter is at our door! Port is a fortified wine produced exclusively in the Douro Valley in Portugal. Port is heavily regulated by the Instituto dos Vinhos do Douro e do Porto. Unlike Champagne, which has impostors all over the globe, Port must be produced, labeled and marketed according to a myriad of strict rules. For someone learning the ropes, this is actually a good thing. So, the region, the additional sweetness and higher alcohol content (20% ABV on average, as opposed to the 14% ABV or less for table wines) are part of what makes Port special. The last part of the equation is the aging. Apéritifs and digestifs are alcoholic drinks served with meals; Apéritifs are served before to stimulate the appetite, digestifs served after to aid digestion. Broadly speaking, there are two main distinctions of Port wine: bottle-aged Port and barrel- aged Port. A more apt term might be “barrel-matured” or “bottle-matured,” since all Port spends some time in a barrel. In general, bottle-aged Port tends to be smoother and less tannic. Barrel- aged Port tends to take on some of the qualities of the wooden barrels, including taste (remember “oakiness”?) and color. Further, barrel-aged Ports (or “wood Ports”) end up more viscous, due to a slight amount of evaporation. We could go further in-depth about the differences between these two styles, but let’s not. You’ll have plenty of time for that later, when you’ve gotten your palate a little bit more snobbed up. For now, let’s talk about the first bottle of Port you’re going to buy. Your First Bottle of Port: Ruby Port Start with a Ruby Port. Ruby Port is on the opposite side of the spectrum from Vintage Port in almost every way, which, for the novice Port appreciator, has more pluses than minuses. Vintage Port, while the undisputed King of Ports, is less enjoyable for everyday imbibing because it has to be treated like fine china—it’s fragile, expensive, and only for special occasions. In fact, it’s so delicate that it has to be consumed within 24-48 hours of opening the bottle. A worthy Ruby Port, on the other hand, costs around $15 and stays good for a month or longer after uncorking it. Ruby Port is typically a blend of young Ports that have been barrel-aged for about three to five years. Ruby Port is often filtered (or fined), meaning it’s ready to drink as soon as it’s bottled—no decanting required. This makes Ruby Port perfect for popping open and serving in a small glasses along with fruit, cheese and other desserts. Most Ruby Port is “fruit- forward,” making it tasty and accessible, albeit starkly less complex than more expensive Ports. Ruby Port can even be served slightly chilled, on the rocks or in cocktails (try a white Port tonic). Ruby Reserve Port (formerly known as Vintage Character Port, until the term was banned in 2002) is similar to Ruby Port in that it’s affordable, bottled ready-to-drink and blended from several vintages. The difference is that Ruby Reserve Port is blended from higher quality wines and is barrel-aged for about five years. Late Bottled Vintage Port (LBV, formerly called “Traditional” Port) is made from wine that’s aged in wood for about four to six years. Unlike Ruby Port, LBV Port comes from a specific vintage and will have a year shown somewhere on the label. Late Bottled Vintage Port is ready to drink as soon as you purchase it—no cellaring required. 2003 was a good year for Taylor Fladgate, Fonseca LBV and Noval, who all have bottles for around $30. LBV can be bottled filtered or unfiltered (e.g. “crusted”). Crusted/unfiltered LBV has more character, and even improves upon cellaring for up to 10 years. But you’ll want to get yourself a metal wine decanting funnel and a decanter to remove the sediment when it’s ready to drink. Tawny Port starts out as Ruby Port, but spends 10 to 40 years in the barrel, rounding out its flavors, oxidizing slightly and taking on a nice mahogany hue from the wood. There are only four ages that a Tawny Port can bear: 10 year, 20, year, 30 year and 40 year. Their long stint in the barrel allows Tawny Ports to shed their fruitiness as they take on a silky mouthfeel, rich, complex flavors and aromas running the gamut from nutty or caramel to chocolate or leathery. As you’d imagine, the greater the age, the greater the price tag and the more nuanced the flavors. 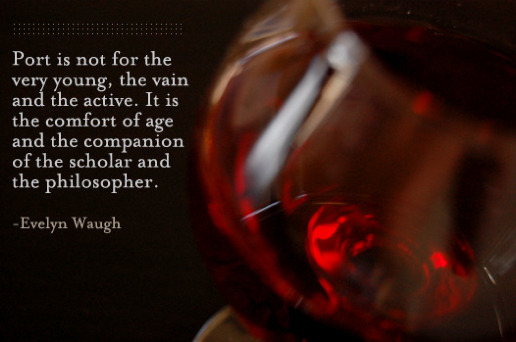 However, most Tawny Port connoisseurs agree that a 20-year Tawny Port provides the best return for your time and money. At this stage, the tannins begin softening up, allowing the flavors to really come forward. Quinta do Portal 20 Year Old Tawny Port and Ferreira Porto Duque de Braganca 20 Year Old Tawny Port are great buys. This is it–the tippy top, the pinnacle of quality. Vintage Port is the only Port on this list that matures in the bottle, meaning that these bottles go straight into the cellar for oh, let’s say about 20 years. That’s because Vintage Port only spends about two years in the barrel before its bottled, meaning it has a lot of maturing to do by the time it hits the shelf. I won’t go too much into Vintage Port, since you’ll want to do some more research, attend some tastings and talk with an expert in person before you begin investing in Vintage Port. But one thing to appreciate about Vintage Port is its rarity—most houses won’t even declare a vintage unless it was an excellent year. While many producers will have a Late Bottled Vintage for every year on the calendar, Vintage Ports may only get bottled thrice in a decade. Except for Vintage Port, Port is relatively resilient and can be stored upright or sideways in a cool, dark place. You can buy specially made Port glasses, which are 8 ounce stemware glasses meant to be filled halfway, but eyeballing 4 ounces into a wide-mouthed red wine glass works, too. Since most Port is red wine, the rule of thumb of serving it at a cool room temperature around 64 to 66 degrees Fahrenheit applies. But aged, less tannic Ports can easily be enjoyed slightly chilled.